Klobuchar was elected Hennepin County attorney in 1998, and reelected in 2002 with no opposition. African American prison admissions in 2006, Klobuchar's last full year, were 22 times higher than whites. Minnesota Lawyer named her "Attorney of the Year". Klobuchar was President of the Minnesota County Attorneys Association from November 2002 to November 2003. Klobuchar ran for a third term and was reelected by a 24-point margin. The Republican nominee was State Senator Jim Newberger. The race was not seen as close, with Klobuchar out-raising Newberger $9.9 million to $210,066 as of October 17. Klobuchar maintained a double-digit lead in the polls all autumn. As of September 2009, 58% of Minnesotans approved of the job she was doing, with 36% disapproving. On March 12, 2010, Rasmussen Reports indicated 67% of Minnesotans approved of the job she was doing. The Winona Daily News described her as a "rare politician who works across the aisle". Walter Mondale said, "She has done better in that miserable Senate than most people there." On March 30, 2008, Klobuchar announced her endorsement of Senator Barack Obama in the Democratic presidential primary, promising her superdelegate vote for him. She cited Obama's performance in the Minnesota caucuses, where he won with 66% of the popular vote, as well as her own "independent judgment". In 2016 she was an early supporter of Hillary Clinton's second campaign for the Democratic presidential nomination. In 1993, Klobuchar married John Bessler, a private practice attorney and a professor at the University of Baltimore School of Law. They have one child, a daughter named Abigail. Klobuchar is a member of the United Church of Christ. Klobuchar has written two books. In 1986 she published Uncovering the Dome, a case study of the 10-year political struggle to build the Hubert H. Humphrey Metrodome. In 2015 she published an autobiography, The Senator Next Door: A Memoir from the Heartland. ^ "Amy Klobuchar is being talked up as a 2020 contender who could 'bury' Trump after she won re-election in Minnesota". Business Insider. November 7, 2018. Archived from the original on November 9, 2018. Retrieved November 9, 2018. ^ Tsukayama, Hayley (March 15, 2010). "Huffington Post names Klobuchar the smartest U.S. Senator". Archived from the original on September 10, 2017. Retrieved May 14, 2017. ^ Dizikes, Cynthia (May 20, 2009). "As state's only senator, Klobuchar gains sympathetic attention". MinnPost. Archived from the original on September 10, 2017. Retrieved May 14, 2017. ^ Nelson, Tim. "Rose Klobuchar, mother of Sen. Amy Klobuchar, dies". Archived from the original on February 23, 2017. Retrieved February 22, 2017. ^ "Born to ride: Jim Klobuchar and the birth of the Minnesota bike tour". Star Tribune. Archived from the original on February 23, 2017. Retrieved February 22, 2017. ^ a b c d e f g DePaulo, Lisa (March 30, 2010). "The Audacity of Minnesota: Meet Senator Amy Klobuchar". ELLE. Archived from the original on May 3, 2017. Retrieved May 14, 2017. ^ "Svet24.si - Druga Slovenka, ki bo Trumpu spodnesla tla". Svet24.si - Vsa resnica na enem mestu. ^ Fajfar, Simona Bandur, Simona (February 11, 2019). "FOTO:Po sledeh slovenskih prednikov Amy Klobuchar". www.delo.si. ^ "1". rootsweb.com. Archived from the original on November 14, 2007. Retrieved September 11, 2015. ^ Klobuchar, Amy (August 25, 2015). The Senator Next Door: A Memoir from the Heartland. Macmillan. ISBN 9781627794176. ^ Klobuchar, Amy (August 25, 2015). The Senator Next Door: A Memoir from the Heartland. ISBN 9781627794176. ^ "WHS Involvement / WHS Distinguished Alumni". www.wayzata.k12.mn.us. Archived from the original on March 17, 2017. Retrieved March 16, 2017. ^ "About Amy". Amy Klobuchar for U.S. Senate. Archived from the original on April 25, 2017. Retrieved March 16, 2017. ^ 1982 Yale Banner, p. 394. ^ Klobuchar, Amy (April 1986). Uncovering the Dome (reprint ed.). Waveland Press. ISBN 978-0-88133-218-6. ^ "Klobuchar, Amy - Biographical Information". bioguide.congress.gov. Archived from the original on February 1, 2007. Retrieved May 14, 2017. ^ Radio, Minnesota Public. "MPR: Campaign 2006: U.S. Senate: Amy Klobuchar". minnesota.publicradio.org. Archived from the original on March 22, 2017. Retrieved May 14, 2017. ^ "Klobuchar timeline: A life of law and politics led to presidential aspirations". ^ "The Senator Next Door: A Memoir from the Heartland - Amy Klobuchar - Google Books". Books.google.com. August 25, 2015. Retrieved December 14, 2018. ^ "The Rachel Maddow Show, Transcript 09/01/15". MSNBC. September 1, 2015. Archived from the original on January 15, 2018. Retrieved May 14, 2017. ^ Glenn Kessler (March 21, 2019). "Klobuchar cites bad data to claim credit for reducing black incarceration". Washington Post. Retrieved March 26, 2019. African American prison admission rates were still 22 times higher than white prison admission rates in 2006. ^ a b Staff, Writer (December 31, 2001). "Minnesota Lawyer recognizes 10 as 'Attorneys of the Year'". Minnesota Lawyer. Archived from the original on March 22, 2017. Retrieved March 21, 2017. ^ Herzig, Frolik & Winnie Frolik & Billy; Herzig, Winnie Frolik & Billy (May 11, 2017). 51 Women Senators? : Will We Ever Have 51 Women Senators? When? How Will They Represent Us?. iUniverse. ISBN 9781440193033. ^ The Fix – The Friday Line: Can Democrats Get to 6? Archived February 24, 2006, at the Wayback Machine. Retrieved October 2, 2006. ^ "Minnesota Election Postmortem: OGGoldy's report card". Daily Kos. Archived from the original on March 16, 2017. Retrieved March 16, 2017. ^ Black, Eric (January 29, 2019). "Why Amy Klobuchar has been dubbed 'the queen' of electability". MinnPost. Retrieved February 12, 2019. ^ Keen, Judy (November 7, 2018). "Amy Klobuchar easily re-elected to Senate; Tina Smith turns back GOP challenge from Karin Housley". Star Tribune. Retrieved February 12, 2019. ^ "SurveyUSA News Poll #15748". Surveyusa.com. Archived from the original on September 18, 2009. Retrieved July 20, 2010. ^ Brett Neely – Minnesota Public Radio News. "Klobuchar a rare politician who works across the aisle". Winona Daily News. Retrieved September 11, 2015. ^ a b "WHICH SENATORS HAVE PASSED THE MOST LAWS?". Northwestern University. Retrieved November 28, 2017. ^ Mazzetti, Michael S. Schmidt, Mark; Apuzzo, Matt (February 14, 2017). "Trump Campaign Aides Had Repeated Contacts With Russian Intelligence". The New York Times. ISSN 0362-4331. Archived from the original on March 2, 2017. Retrieved February 23, 2017. ^ "Sen. Amy Klobuchar On Investigating Trump And Russia". NPR.org. Archived from the original on February 23, 2017. Retrieved February 23, 2017. ^ "Sen. Amy Klobuchar, state's Democrats want open investigation of Trump Russia ties". Star Tribune. Archived from the original on February 22, 2017. Retrieved February 23, 2017. ^ "Minnesota Poll results: What Minnesotans think of their senators". Star Tribune. Archived from the original on December 1, 2017. Retrieved November 28, 2017. ^ "America's Most and Least Popular Senators". Morning Consult. Archived from the original on November 29, 2017. Retrieved November 28, 2017. ^ "Franken's Minnesota support dims amid sexual misconduct claims". KSTP-TV. Archived from the original on December 1, 2017. Retrieved November 28, 2017. ^ "The 'Worst Bosses' in Congress?". Politico. March 21, 2018. Retrieved February 19, 2019. ^ "Subcommittees | United States Senate Committee on the Judiciary". www.judiciary.senate.gov. Retrieved February 6, 2019. ^ "U.S. Senate Committee On Commerce, Science, & Transportation". U.S. Senate Committee On Commerce, Science, & Transportation. Retrieved February 6, 2019. ^ "Senate Democrats elect Chuck Schumer as their new leader". Archived from the original on November 19, 2016. Retrieved November 19, 2016. ^ "Members". Congressional NextGen 9-1-1 Caucus. Archived from the original on June 12, 2018. Retrieved June 14, 2018. ^ Buoen, Roger. "Klobuchar to endorse Obama". MinnPost.com. Archived from the original on April 18, 2008. Retrieved March 31, 2008. ^ "Klobuchar gets behind Clinton in '16". Archived from the original on November 7, 2018. Retrieved October 12, 2018. ^ Stassen-Berger, Rachel. "Amy Klobuchar, Bernie Sanders will debate GOPers over health care on CNN". Twin Cities Pioneer Press. Archived from the original on December 1, 2017. Retrieved November 21, 2017. ^ Zernike, Kate (May 18, 2008). "She Just Might Be President Someday". The New York Times. Archived from the original on April 6, 2017. ^ Davidson Sorkin, Amy (December 12, 2016). "Thirteen Women Who Should Think About Running for President in 2020". The New Yorker. Archived from the original on February 24, 2017. Retrieved February 23, 2017. ^ Curry, Tom. "Practical female politico sought for court - Politics - Capitol Hill". MSNBC. Archived from the original on April 13, 2010. Retrieved July 20, 2010. ^ Toobin, Jeffrey. "The Supreme Court Farm Team". The New Yorker. Archived from the original on October 21, 2014. Retrieved March 17, 2014. ^ Smith, Mitch; Lerer, Lisa (February 10, 2019). "Amy Klobuchar enters 2020 Presidential race". The New York Times. Retrieved February 10, 2019. ^ Klobuchar, Amy. 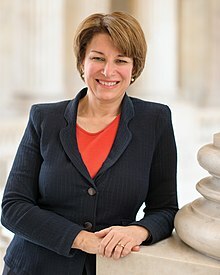 "Amy Klobuchar". www.congress.gov. Archived from the original on September 10, 2015. Retrieved January 24, 2018. ^ Bycoffe, Aaron (January 30, 2017). "Tracking Congress In The Age Of Trump". FiveThirtyEight. Archived from the original on January 2, 2019. Retrieved January 4, 2019. ^ "Barack Obama, candidate for President, is 'UCC'". United Church of Christ. Archived from the original on November 30, 2018. Retrieved October 17, 2018. ^ Goetzman, Amy (August 28, 2015). "Klobuchar's 'The Senator Next Door' centers on the people who shaped her politics". MinnPost. Archived from the original on December 1, 2017. Retrieved November 21, 2017. ^ "THE SENATOR NEXT DOOR". Kirkus Reviews. July 1, 2015. Archived from the original on December 1, 2017. Retrieved November 21, 2017. ^ a b "Washington Post Live-Amy Klobuchar". Washington Post. April 11, 2013. Archived from the original on December 6, 2017. Retrieved November 21, 2017. ^ "Senator Amy Klobuchar recognized for support of Recreational Trails Program". American Trails. Archived from the original on September 18, 2017. Retrieved September 18, 2017. ^ Hummell, Michelle (March 11, 2013). "Senator Amy Klobuchar (D-MN) and Congressman John Mica (R-FL) Named ARA Legislators of the Year". Agricultural Retailers Association. Retrieved November 21, 2017. ^ "Klobuchar Receives Award for Work Fighting Sexual Assault in the Military". US Senator Amy Klobuchar. April 18, 2013. Archived from the original on December 1, 2017. Retrieved November 21, 2017. ^ "2013 Friend of CACFP- Senator Amy Klobuchar, Minnesota". National CACFP Sponsors Association. 2013. Archived from the original on December 1, 2017. Retrieved November 21, 2017. ^ "Senators Klobuchar and Franken Receive Minnesota Farm Bureau "Friend of Farm Bureau" Award". Minnesota Farm Bureau. October 31, 2014. Archived from the original on December 1, 2017. Retrieved November 21, 2017. ^ "ABA honors Minnesota Sen. Amy Klobuchar for efforts to protect vulnerable populations, eliminate workplace discrimination". American Bar Association. April 13, 2015. Archived from the original on December 1, 2017. Retrieved November 21, 2017. ^ "Sen. Klobuchar gets top honor from National Consumers League". MinnPost. October 7, 2015. Archived from the original on December 1, 2017. Retrieved November 21, 2017. ^ "SENATOR AMY KLOBUCHAR HONORED WITH GOODWILL'S POLICYMAKER AWARD". Goodwill. 2016. Archived from the original on December 1, 2017. Retrieved November 21, 2017. ^ Zuercher, Hannah (May 10, 2017). "MWL Congratulates 2017 NAWL Annual Awardees: Senator Amy Klobuchar and Hon. Wilhelmina M. Wright". Minnesota Women Lawyers. Archived from the original on December 1, 2017. Retrieved November 21, 2017. ^ "Sen. Amy Klobuchar as the Mary Louise Smith Chair in Women and Politics". Think Ames. August 31, 2017. Archived from the original on December 1, 2017. Retrieved November 28, 2017. ^ "County Offices: Official Results" (PDF). Minnesota Secretary of State. Archived from the original (PDF) on September 5, 2005. Retrieved January 5, 2009. ^ "Unofficial Results: General Election". Minnesota Secretary of State. Archived from the original on May 17, 2012. Retrieved January 5, 2009. ^ "Statewide Results for U.S. Senator". sos.state.mn.us. Archived from the original on June 11, 2013. Retrieved November 13, 2012.